First Lines: Daniel rolled over and punched his pillow. "Ugh! I give up," he muttered. Daniel's father has gotten himself killed and left another mess for Daniel to clean up. To save his world from destruction, he must fight off his father's killers while discovering a way to save his world. Time is running out, and Daniel must choose to either walk in his father's footsteps or to reinvent himself into the one to save his world. 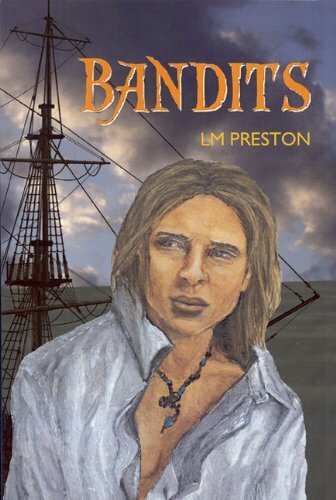 I was lucky enough to get a sneak preview of Bandits while waiting for my copy. After the twenty-five pages preview I was left wanting more! So when the book arrived I was really excited but due to a backlog of review books I couldn't get to this one right away. The first thing I have to say was I was really drawn into how well L.M. Preston is in creating worlds. Merwin was such a vivid and easily imagined planet and the story was easy to imagine. The creatures and the lives the characters live are definitely unique. The story is told mostly from Daniel's POV and while Daniel is quite bitter at his father in the beginning, I still warmed up to him pretty quick. Both the main and secondary characters are well developed and I especially liked how Jade was portrayed as a strong and stubborn character, which fits well with the world they lived in. Another thing I liked was the treasure troves!! The booby traps, the treasure, and the adventure just to get to these places! I had myself wishing I had a treasure trove island lol although maybe with not so much deadly booby traps.. I'd probably forget where they were lol. And I'd definitely have a pet Bubbles :) The adventure was neverending and exciting! There was one thing that did niggle at me. Even though this was an ARC I did find the few errors while reading which had me stumbling a little every now and then. I could overlook it though since I was so drawn into the story but the inner editor in me tended to point them out a bit. Overall I did really enjoy Bandits. The characters were wonderful, the world was awesome and there was none stop adventure. Great Read!